Paris, France, 7 December 2015 – With the backdrop of the private sector day at the COP21 in Paris, Executive Secretary of the UNFCCC Christiana Figueres commended the business community for taking decisive steps to combat climate change – as showcased during the business and industry (BINGO) Day coordinated by ICC and at the IETA/WBSCD Open for Business Hub. “The interests of governments, the private sector and cities are aligning as never before. In doing so we are witnessing the turning point in the way the global economy prices pollution and invests in real wealth— keys to unlock our collective ambition of an ambitious Paris Agreement in 2015 and catalysts towards keeping a global temperature rise under 2 degrees this century,” said Ms. Figueres during the BINGO day at the climate negotiations in Paris. The thematic day, coordinated by the International Chamber of Commerce (ICC) together with partner organisations and endorsed by IETA, WBCSD and We Mean Business Coalition, saw key decision-makers from the corporate world gather to share expertise in technology cooperation and development, climate finance and research and development. “A single silver bullet will not be sufficient to bring about the systemic change required. Climate action within business must be powered by both radical innovation and by people with the skills and capabilities to trigger this innovation. Business can collaborate to achieve more in responding to this global challenge,” emphasised Bertrand van Ee, CEO, Climate-KIC. “Clean energy solutions exist today to meet the challenges of climate change. Businesses in these sectors seek policy and investment signals to unlock private capital. The INDCs being considered at COP-21 offer a roadmap for public-private partnership,” said Lisa Jacobson, President of the Business Council for Sustainable Energy (BCSE). FICCI, the apex business and industry organization in India, believes that “business has a key role to play in climate change mitigation and adaptation through innovation in technology, finance and business models. Indian businesses are demonstrating their own approach to address the climate change challenge. A strong policy signal would help businesses make investment decisions to support longer term efforts,” as highlighted by Dr. A Didar Singh, Secretary General, FICCI. Climate-KIC is the EU’s largest public private partnership addressing climate change through innovation to build a zero carbon economy. We address climate change across four priority themes: urban areas, land use, production systems, climate metrics and finance. Education is at the heart of these themes to inspire and empower the next generation of climate leaders. We run programmes for students, start-ups and innovators across Europe via centres in major cities, convening a community of the best people and organisations. Our approach starts with improving the way people live in cities. Our focus on industry creates the products required for a better living environment, and we look to optimise land use to produce the food people need. Climate-KIC is supported by the European Institute of Innovation and Technology (EIT), a body of the European Union. 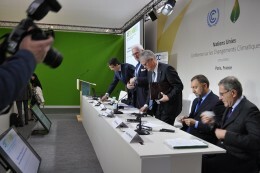 IETA is the voice of business on carbon markets around the world. Established in 1999, IETA’s members include global leaders in the oil, electricity, cement, aluminium, chemical, technology, data verification, broking, trading, legal, finance, and consulting industries. Together with its members, the council applies its respected thought leadership and effective advocacy to generate constructive solutions and take shared action. For more information visit http://www.wbcsd.org/ . We Mean Business is a coalition of organizations working with thousands of the world’s most influential businesses and investors. These businesses recognize that the transition to a low carbon economy is the only way to secure sustainable economic growth and prosperity for all. To accelerate this transition, we have formed a common platform to amplify the business voice, catalyze bold climate action by all, and promote smart policy frameworks. The Zurich-based South Pole Group is the world’s leading provider of climate solutions. South Pole Group helps public and private sector organisations develop climate proven policies and strategies. Areas of expertise cover every key sustainability-related area of climate change, including but not limited to: carbon credit solutions, green finance, sustainable cities & buildings, as well as renewable energy and energy efficiency. For more information, visit www.thesouthpolegroup.com or follow the company @southpolegroup.